The word “Escanaba” roughly translates from various regional native languages to “land of the red buck” although some people maintain that it refers to “flat rock”. Escanaba was an Ojibwa village in the early 19th century. As an American settlement, Escanaba began as a port town in the mid-19th century, gaining importance to the Union as a shipping point for iron ore, lumber and copper during the Civil War. In his poem “The Song of Hiawatha”, Henry Wadsworth Longfellow described how Hiawatha “crossed the rushing Esconaba” referring to the river. Located on Little Bay de Noc at the northern edge of Lake Michigan, Escanaba continues to serve as an important shipping point for iron ore to other Great Lakes ports, especially south to Chicago and northern Indiana. The local paper mill, for many years Mead Corporation’s Publishing Paper Division, is currently operated by Verso Corporation; located on the outskirts of the city alongside the Escanaba River, it is now the area’s largest employer. As shipping increased, a lighthouse was needed to warn of a sand shoals that reached out into Little Bay de Noc from Sand Point, a sandspit located just south of and adjacent to the harbor area. The United States Lighthouse Service approved construction of the Sand Point Lighthouse at a cost of $11,000. Construction began in the fall of 1867 and was completed in early spring 1868. It was deactivated in 1939, and was used by the United States Coast Guard to house seaman assigned to Escanaba. The building was completely restored to its original design in the late 1980s, and placed on the National Register of Historic Places. The historic House of Ludington, downtown Escanaba. 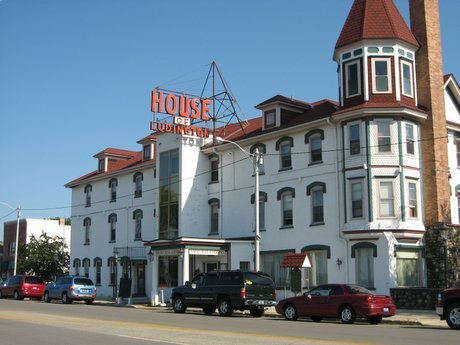 The House of Ludington is a landmark historic hotel in downtown Escanaba. Originally built in 1865 as the Gaynor House Hotel, it was renamed after lumberman Nelson Ludington 1871. It was rebuilt as a brick structure in the Queen Anne Style in 1883, becoming the New Ludington Hotel. Bay de Noc Community College, a public 2-year college, was founded in the city in 1962.